From the deep blue waters of the Adriatic to glittering waterfalls and lakes, mountains and ancient walled towns, Croatia’s beauty runs deep. Croatia offers something for everyone, vibrant cities surrounded by ancient forts are a treat to explore, as are Croatia’s beaches and islands, culture and fabulous food. 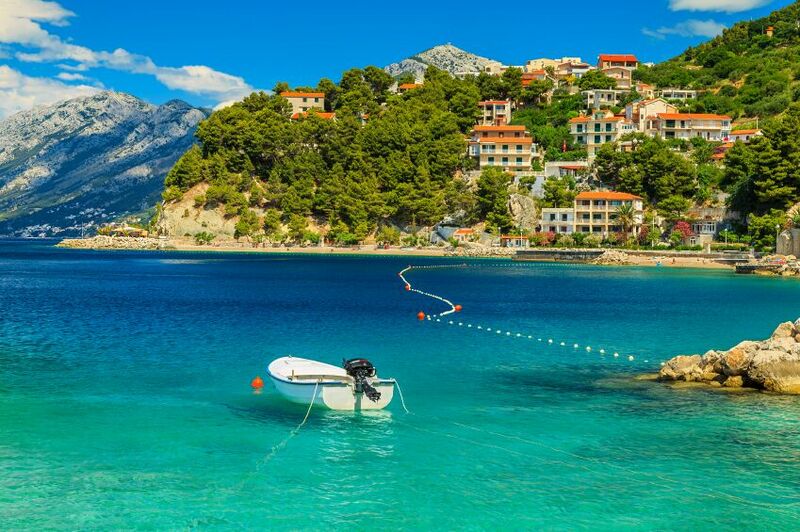 Meanwhile, resorts like Brac and Hvar will have you dancing all night and soaking up the sun all day. Croatia holidays just don’t seem complete without a certain amount of beach appreciation. Whether that means hours sizzling in the sun, a tranquil walk along sandy shores or sumptuous cocktails as you watch the sun sink below the horizon – the choice is yours but one thing is for sure: you will be mesmerised by Croatia’s beautiful beaches. Part of the appeal lies in their sheer diversity, islands like Hvar offer glitz and glamour, fancy yachts and designer fashion, while in other areas Croatian families are busy with buckets and spades. There’s also plenty of opportunity to find peace and quiet in secluded coves that lie waiting for you to discover. Tourists from Britain, Germany and beyond tend to flock to the Dalmatian coast, not only for the beaches, but also to explore the gorgeous seaside cities of Split and Dubrovnik. In the evenings, classical music concerts and other cultural events often take place in the city centres. Sailing fulfils sunny dreams of gliding across glittering waters with the wind in your hair. It’s usually easy to pick up a yacht charter or join a boat trip from the mainland to discover Croatia’s multitude of islands. If you’re not discovering picturesque coastal towns, you’re likely to be witnessing some of Croatia’s spectacular natural wonders in the national parks: waterfalls, canyons, lakes, wildlife and forests all await you. If you like a change of scene each day, you might try island hopping. Croatia has over 1,100 in all ranging from the remote islets of the Kornati archipelago to the party capital of Hvar. Hopping between the mostly traffic-free Elaphite Islands of Sipan, Kolocep and Lopud, near Dubrovnik can be very satisfying if you love secluded coves and beaches with the added attraction of great-value restaurants. Hiking and climbing are favourite pursuits in Croatia. Velebit, Croatia’s most extensive mountain range, is well organised for hiking and lies just inland from the coast between Senj and Starigrad-Paklenica.Here you’ll also find the two national parks of Sjeverni Velebit in the north and Paklenica in the south. Other Croatian national parks well worth exploring on foot include: Kornati, encompassing a rocky, virtually uninhabited archipelago of some ninety scattered island paradises; Krka with its picturesque canyon, spectacular Skradin waterfalls and the islet of Visovac; Plitvice Lakes, a UNESCO listed park of woodlands, high waterfalls and sixteen glorious turquoise lakes; and Brijuni, an archipelago of fourteen unspoilt islands off the west coast of Istria. You can stay overnight on the largest island, Veli Brijun, with its golf course and safari park. Cycling is popular in Mljet National Park which lies on the green, unspoilt island of Mljet. You will be pedalling through dense forests via two saltwater lakes. In the centre of the larger lake, sits the pretty St Mary’s Island with its Benedictine monastery. For a bird’s eye view of historic Dubrovnik, the cable car will whisk you 405 metres up to the top of Mt Srđ in just under four minutes. On a clear day, you will get an awesome perspective of the city from the summit. Take in the sights of the terracotta-tiled rooftops of the old town with Lokrum Island, the Adriatic Sea and the Elafiti Islands dotting the horizon. You can pick out all the details with one of the telescopes on hire at the top. Nightlife can get hectic, particularly on the islands of Pag, Brac and Hvar, all of which have developed reputations as ideal for sunbathing and living it up. Brac and Pag’s Novalja, in the north, has a large summertime population of fun loving, party-going crowds. Hvar is blessed with several good restaurants, clubs and bars but bear in mind that the island’s well-heeled crowds keep prices on the higher side. History buffs will be completely spoilt for UNESCO World Heritage Sites to explore in Croatia. You cannot miss Dubrovnik, undoubtedly the most famous historic location in Croatia. Its Old Town is one of the best-preserved medieval walled cities on the Mediterranean. Step back in time and walk the circuit of the 13th-century city walls with the shimmering Adriatic Sea below, before descending to explore the UNESCO World Heritage-listed Old Town. Drop in at the Franciscan Monastery where you’ll find Europe’s oldest pharmacy, as well as beautifully adorned baroque churches. You can uncover some more of Dubrovnik’s turbulent history at the Rector’s Palace, the Maritime Museum and War Photo Limited. Šibenik, Central Dalmatia’s second city is famed for its 15th century UNESCO-listed Cathedral of St James which is a must-see on your way to Split, the capital of Central Dalmatia. It was founded by the Roman Emperor Diocletian in the third century AD and is popular not only for its historic attractions, but as the place to hop on a ferry to Croatia’s popular islands. At its historical core is the amazing Diocletian’s Palace – yet another UNESCO World Heritage Site – now a maze of alleyways, houses, shops and historic architecture spanning some 1,700 years. Just west of Split lies the tiny medieval city of Trogir founded by the Greeks in the third century BC. Here you will discover the intricate Romanesque cathedral and gothic Venetian stone buildings which have earned it its UNESCO World Heritage site listing. Zagreb is Croatia’s capital city and is firmly on the tourist track, thanks to its beautiful architecture, huge number of museums and galleries, and a lively restaurant and café culture. You will also find lovely parks and gardens which all make Zagreb a fascinating place to enjoy plenty of history plus Croatian city culture. Don’t miss the monuments of Gornji Grad; the Cathedral; St Mark’s Church; and the Sabor. Then take a look inside the museums of Zagreb’s 19th-century area of Donji Grad. Poreč dates back to Roman times and sits on a small peninsula off Istria’s west coast in northwest Croatia. Climb up the tower of its star attraction, the UNESCO World Heritage-listed, Euphrasius Basilica. It also boasts a stunning collection of sixth century Byzantine mosaics. 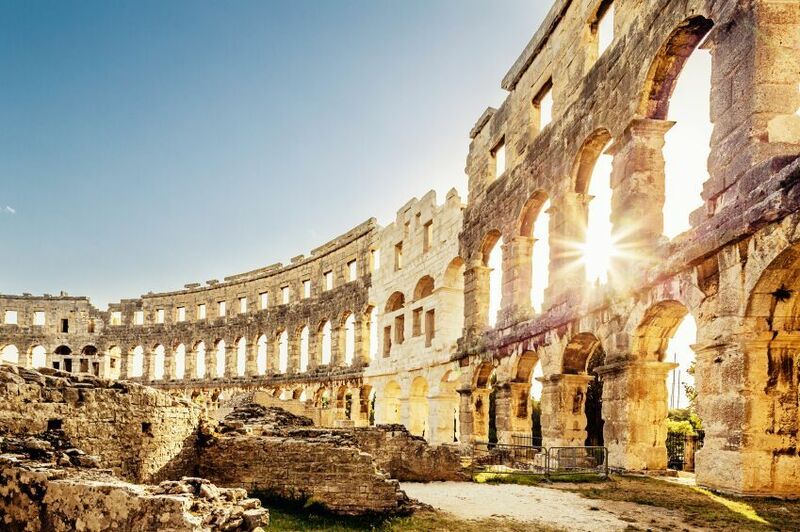 While on the Istrian coast, you might like to drop in on Pula too, with its fine Roman ruins encompassing a very well-preserved amphitheatre which is one of the biggest remaining in the world. The Istria and Dalmatia coasts are famed for their fresh seafood. On the menu you’ll find plenty of shellfish and barbecued fresh fish, the most popular being gilthead bream and sea bass. Volosko is a gastronomic enclave where you’ll find some of Croatia’s best seafood restaurants located in a pretty fishing village on the Adriatic Coast, just outside the popular resort of Opatija. Seafood is simply served with the Mediterranean fare of fresh seasonal produce like flavoursome tomatoes, aubergines, peppers and courgettes. But eating out in Croatia is not only about seafood. Croatian cuisine is heavily influenced by the Italians, unsurprisingly so when you consider it is separated from Italy only by the Adriatic Sea. This proximity has brought the two countries into close contact over the years and for nearly 400 years, much of the Dalmatian region of Croatia was in fact controlled by the Republic of Venice, creating a strong tradition of Italian cuisine in Croatia. You will find top quality Italian dishes almost everywhere you eat, favourites being risottos, ice creams, pizzas and pasta. You will also come across some exquisite cakes and desserts all over Croatia from gelato and pancakes to pastries, torta, and even baklava. You might also like to look out for the more “Croatian” specialties like: Pršut i paški sir, a take on Italian dried prosciutto ham; sheep’s cheese from Pag island; Grah, a hearty sausage and haricot bean soup; Janjetina, roast lamb cooked on a spit; Fuži, stuffed cylinder-shaped dough; Pariški odrezak, pork schnitzel sometimes stuffed with cheese or ham; and Strukli, boiled dough filled with cottage cheese. Fish specialties include: Salata od hobotnice, octopus salad with onion, potato, parsley, lemon and garlic; Crni riýot, cuttlefish risotto cooked in its own ink; and Salata od jastoga, lobster salad with herbs and local olive oil. For desert, try Rožata, Dubrovnik’s delicious take on crème caramel. Finally, if you are in inland Istria during autumn, seek out the truffles (tartufi) which are the local delicacy. Wine enthusiasts won’t go short either. Croatia produces plenty of its own wine, the most prestigious reds generally coming from the Pelješac peninsula area – try the Plavac Mali. Whites such as Malvazija, Grasevina, and Posip are mostly produced in eastern Slovenia and Istria.